Universal Pipe Tubes are the perfect solution for safe carriage of piping and anything you can fit into the 125mm square tube. Designed to hold up to 50 lengths of 15mm copper tubing. The new locking mechanism improves security with the introduction of a key locking bracket. 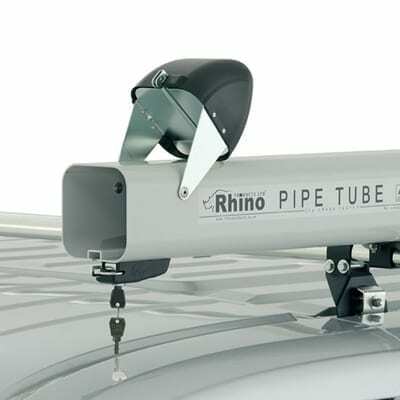 Fully universal pipe tube to fit any roof rack and any van, comes complete with all fixings and easy to read instructions. The NEW Rhino universal pipe tube carrier. Modern design manufactured from aluminium tubing for lightness and strength. The end cones are manufactured from glass filled plastic with an integral steel bulkhead for increased strength and security, aerodynamic design lowers wind drag and noise. New locking mechanism improves security and the product has been fully crash tested at 20g. Full TUV approval has been obtained for this product.